Five files from the Barney Oldfield scrapbook documenting the 1906 Broadway Play starring Elsie Janis. Barney Oldfield was also featured as he developed a special effect perfect for the play. 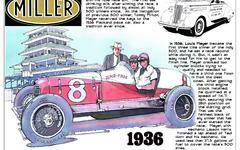 It involved a pair of treadmills, two of his race cars, and his longtime partner, Tom Cooper. Oldfield and Cooper drove their cars on the treadmills and together with scenery props rotating on a carousel in the background and bags of dirt kicked up by their wheels; they were able to simulate an auto race. Janis was only 17 years old at the time of the play’s opening. I pulled this content from Barney Oldfield's personal scrapbook and like virtually all the material in the collection it is poorly organized and not in the best condition. There are two articles, but it is unclear whether they were published in the same newspaper or even came from the same time period. This content was lifted from the Barney Oldfield scrapbook. Like most of the material from that source, the name of the newspaper that originally published it, as well as the date, was snipped from the clipping. The main article is very hard to read because the quality of the photocopy of this 100 year-plus newsprint article was poor. However, you can read almost every word if you have patience. I think the article has a lot of good information for anyone exploring Oldfield's life. This content was lifted from the Barney Oldfield scrapbook. Like most of the material from that source, the name of the newspaper that originally published it, as well as the date, was snipped from the clipping. The main article is very hard to read because the quality of the photocopy of this 100 year-plus newsprint article was poor. This content was lifted from the Barney Oldfield scrapbook. Like most of the material from that source, the name of the newspaper that originally published it, as well as the date, was snipped from the clipping. This is a collection of eight articles and all appear to be from 1906. This content was lifted from the Barney Oldfield scrapbook. Like most of the material from that source, the name of the newspaper that originally published it, as well as the date, was snipped from the clipping. This is a collection of five articles and all appear to be from 1906. This content was lifted from the Barney Oldfield scrapbook. Like most of the material from that source, the name of the newspaper that originally published it, as well as the date, was snipped from the clipping. This collection is two brief articles. This brief item from the Indianapolis Star mentions that Barney Oldfield was acting in the Broadway Play, "The Vanderbilt Cup." The article was published on February 6, 1906 and describes Oldfield's visit to that year's edition of the annual Chicago Automobile Show. It is reported that a large crowd followed him on his tour of the exhibits. This profile of American theatrical star Elsie Janis was published in the Indianapolis Sun on June 8, 1907. Janis starred in the Broadway play, "The Vanderbilt Cup," which was more than entertainment but a milestone that demonstrated how the automobile had cleared a hurdle of acceptance in popular culture.